In 1947/48 India toured Australia for the first time. There were five Tests, four of them won very easily by Australia, whose skipper Donald Bradman averaged the small matter of 178.75. Despite their drubbing several of the Indians, who were without their leading batsman Vijay Merchant, emerged with credit. 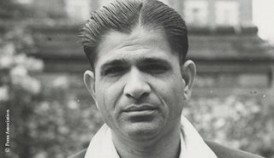 All-rounder Vinoo Mankad, a fine orthodox left arm spinner, was one of them. The fifth match of the tour was against a strong Australian XI, and India ran out winners by 47 runs. In the Australian second innings Mankad warned the Australian opener, Bill Brown, that he was backing up too far. When he did it again Mankad whipped off the bails, appealed, and Brown had to go. The Australians were attempting to score 251 to win at 100 per hour, so were chasing hard. Mankad took 8-84 in the innings, and in the words of The Cricketer’s correspondent The crowd realised the fairness of the bowler’s action and cheered him. Less than a month later the same thing happened in the second Test, at the Sydney Cricket Ground. This was the game that India drew. The weather had the last word in the end but despite the tourists being dismissed for only 188 they still secured a first innings lead of 81. This was a different situation in that there was no run chase on, nor according to some sources was there any warning given. This time The Cricketer commented that ….. the bowler was, of course, perfectly within his rights. The crowd reaction is not recorded, although 40 years later a letter appeared in the magazine suggesting that once again the spectators had been magnanimous towards Mankad. There was some controversy, indeed Mankad’s biographer described it as a terrific commotion. Bradman was moved to express the view in an autobiography that was published a couple of years later; The laws of cricket make it quite clear that the non-striker must keep within his ground until the ball has been delivered. If not, why is the provision there which enables the bowler to run him out? It seems that was the view of most. Brown himself never complained, and indeed his Wisden obituary states that he maintained he had been warned on both occasions, and Bradman referred to a warning as well. Only one member of the Indian side ever wrote an autobiography, Vijay Hazare, but despite going into print as many as three times, in 1964, 1974 and 1981, rather disappointingly he doesn’t mention either dismissal. Contemporary writers, including former First Class player John “Ginty” Lush, maintained there was no warning. Ever since 1948 this means of running a batsman out has been known, not very imaginatively, as “mankading”. It was extremely rare. Prior to those two incidents as far as I can see the only previous occasion a batsman had been run out in this way in the 20th century was a decade earlier when Khadim Hussain, bowling to young Joe Hardstaff in a tour match between Sind and Lionel Tennyson’s XI, did the self-same thing. The incident is noted in Gerald Brodribb’s miscellany on the laws, Next Man In, but neither Wisden nor a recent biography of Hardstaff even mentions it in passing, so it cannot have ruffled too many feathers. The concept was not however wholly unknown. There were incidents where warnings were given. One that must have been entertaining came in a County Championship match between Surrey and Yorkshire. The bowler was Emmott Robinson, as Yorkshire as a pint of Theakstons and a slice of Parkin cake, and the non-striker Douglas Jardine. Emmott stopped in his delivery stride and, with Jardine three or four yards towards the other end, said “Nah then, hev I to do it?” Sadly the Iron Duke’s response is not, as far as I am aware, recorded anywhere. In 1956 there was a mankading in a County Championship fixture for the first time in more than 60 years and, possibly, for only the second time ever. This dismissal took place early on in the game before it had even begin to take shape. The bowler was Glamorgan skipper Wilf Wooller. A bustling pace bowler Wooller was old school, and a rumbustuous character not given to suffering fools gladly. He would not normally have entertained the idea of mankading an opponent, but after Essex opener Geoff Barker was still transgressing after three warnings no doubt felt his actions totally justified. An interesting perpetrator was West Indian quick Charlie Griffith, who was responsible for the first Caribbean mankading in 1963/64. The incident is not mentioned in his autobiography though, so presumably he was not particularly proud of what he did. Much more surprising is the action of part-time off spinner Barry Richards in mankading Ray Gripper in 1968/69 when playing for Natal against Rhodesia. Quite why a specialist batsman would do that is beyond me, the more so as Richards apparently gave no warning. Perhaps it is no surprise in the circumstances that there is no mention of the game, which appears to have been drifting towards an inevitable draw at the time, in Richards’ autobiography. A couple of months after the Richards incident Test cricket saw its second mankading. The man responsible was Griffith, and the batsman Australia’s Ian Redpath. The Australians were looking for quick runs, and there was no warning given. At the next interval West Indies skipper Garry Sobers went into the Australian dressing room and apologised. As Australia ended up 20 short of victory with their last pair at the crease it may have been a crucial move. The Australian crowd were incensed, but then Big Bad Charlie was that sort of character. In the press it was notable that men like Tiger O’Reilly and Keith Miller, neither of whom would surely have contemplated doing the same thing, both came out in favour of Griffith, and one or two, although not Griffith, pointed out that the Australians as a team had been warned earlier in the proceedings when Ian Chappell’s attention was drawn to the issue by David Holford. Griffith did mention this one in his book, and not surprisingly quoted my old friend Keith Miller at some length. Next time Redpath encountered Griffith he got a crack on the head for his trouble, but there is no suggestion that Griffith disliked him more than any other opposing batsman. Redpath certainly had a tendency to try and steal a march on the fielding side and found himself mankaded again five years later, when he was caught out backing up too far by Western Australia’s pace bowler Dennis Baker. The umpire quite properly gave Redpath out, but Wests skipper John Inverarity was allowed to withdraw the appeal and Redpath was reinstated. Derek Randall was Test cricket’s next victim, at the hands of Ewan Chatfield in 1977/78. There was no warning then, although a pointed remark from the bowler to his mid off designed for Randall to hear was uttered. England were not happy, and Chatfield lost his place for a while. No causal link was ever acknowledged, but certainly Chatfield felt let down. At the time England were chasing quick runs. From reading a number of accounts of the incident it seems certain that the “warning” was given, but that in all probability Randall, concentrating on his innings, didn’t take it in. Just over a year after the Randall episode came another mankading, and an object lesson in the potential this mode of dismissal has for creating ill-feeling. It was a two match series in Australia involving Pakistan. The visitors won the first Test so Australia had to win the second. They took a fifty run first innings lead but then Asif Iqbal scored a superb century whilst marshalling the tail extremely well. With one wicket to fall Pakistan were 235 in front with Asif and Sikander Bakht having put on 20 for the last wicket. Sikander was, to the obvious frustration of Aussie paceman Alan Hurst, backing up a long way as Asif looked to take the singles he needed to farm the bowling. Eventually, without a specific warning, Hurst mankaded Sikander. So furious were the Pakistanis that during the Australians’ successful pursuit of victory when non-striker Alan Hilditch picked the ball up to return it to the Pakistanis after a wayward throw, Sarfraz Nawaz appealed for Handled the Ball and Hilditch had to go. It was probably a good job that there were just the two Tests in that series. Rather different were events in a Test match in Multan in 2003 between Pakistan and Bangladesh. These were the days when the Tigers had never won a Test, and never looked like doing so. Here though they took a first innings lad of 106, and then had the disappointment in their second innings of seeing Alok Kapali’s knock cut short by the home ‘keeper, Rashid Latif, claiming a non-existent catch. In the end it was heartbreak for the Banglas as a matchwinning innings from Inzamam saw Pakistan home. With the home side eight down and Inzamam manipulating the strike with aplomb the visitors’ much respected left arm spinner, Mohammed Rafique, found himself with a mankading opportunity. He chose to warn Umar Gul instead and, arguably, cost his side the game. As time has passed the game has become more professional, and the stakes much higher for those involved in the international game. The tradition of giving a warning to a batsman, and a tradition is exactly what it is as the need for a warning has never been enshrined in the laws, has continued. Stealing runs is more relevant in the game’s shorter formats than in Test cricket and there have been a number of incidents in ODIs down the years, going right back to 1974/75 when Brian Luckhurst suffered the fate at the hands of Greg Chappell. At opposite ends of the “ill-will” spectrum were Kapil Dev’s appeal against Peter Kirsten in 1992/93 and Courtney Walsh’s warning to Saleem Jaffar in the 1987 World Cup. Somewhere between the two was Virender Sehwag’s decision to withdraw an appeal after Ravichandran Ashwin had mankaded Lahiru Thirimanne in 2012. The so-called Friendship Tour of India to South Africa in 1992/93 turned sour when, in the second ODI, Kapil mankaded Kirsten without any notice on the day, but after three previous warnings on the tour. Kirsten was furious as were all the South Africans whose skipper, Kepler Wessels, later struck Kapil across the shins with his bat. Fortunately for Wessels match referee Clive Lloyd decided there was insufficient evidence of intent and he escaped censure. It was Kapil’s turn to be furious. As for Walsh as he ran in to bowl in Lahore the last Pakistan pair were at the wicket and they needed just four to win off the last ball. Walsh approached his delivery stride with Jaffar in no man’s land. Clearly not from the Griffith school of Caribbean pace bowling however, Walsh chose to warn Jaffar rather than mankad him. When the delivery was finally bowled Abdul Qadir got the boundary needed, and West Indies missed out on a semi-final place. Mankading dismissals remain rare, but are back in the news in England because of Joss Buttler’s innings in the deciding ODI last week. England skipper Alistair Cook is no Bradman, and he proved that once and for all by his comments after the game. The reality is that Buttler can have no complaint, and nor should Cook. England’s great new hope tried to steal a march on the Sri Lankans. None of the laws of the game were broken, but there is sometimes a price to pay if your tactics don’t succeed. After all if as a result of backing up too far a batsman completes a run the bowling side can have no redress. Putting it another way if Buttler had been at the striker’s end and given Senanayake the charge, missed and been stumped, Cook would not have sought to complain. It would have been absurd to blame the bowler for tempting his man out of his crease with his deceptive flight, even if Buttler had genuinely believed he had his back foot anchored only to be lured forwards. Cook bleating about his man being mankaded is, in many ways, a distinction without a difference. It is down to a batsman where he puts his feet, and he has no one to blame but himself if that gives the opposition the chance to take his wicket. The Spirit of Cricket is an expression that has been bandied about a good deal in recent days – some will say that the conduct of Rafique, Walsh and Inverarity are shining examples of it, and that Kapil Dev, Hurst and Griffith have disregarded it. But that misses the point. The Spirit of Cricket is not something that is capable of precise definition, but we all know that cricketers the world over adhere to it day in day out, as Senanayake did on Tuesday by taking the trouble to warn Buttler when he was under no obligation to do so – at the end of the day The Spirit of Cricket is the concept that separates cricketers from mere professional sportsmen. My (relatively) recent book, Swift Underhand, records the earliest incidence of this, at least in Australia, in the 1861-62 match between New South Wales and Victoria. The bowler was John Kinloch, of NSW, and the Victorian crowd thought that it was an ingenious and hialrious trick, even though their own batsman, Huddleston, was run out. I don’t think the spirit of cricket exists at international level. Certainly does at club level. But I don’t accept that you can call a guy a **** for 8 hours and then insist you have played the game within the spirit it was intended. At least Mankadding visibly and more honestly violates the code rather than more insidious practices. I had a chance to mankadd a player in a game. He was backing up way too far. I warned him once but he blew me off. It was a goodwill friendly tournament. So I had a think about it. And told the umpire to warn him as I was going to do it next ball if he wandered again. The umpire wanted to laugh me off as well but decided to take me seriously and issued said warning and all was resolved. After the game I lost my ticket to the beer tent and was skint. So I appealed to the tournament organiser and he gave me a free ticket – which he may not have done had I have handled myself differently 3 hours earlier.